Last week I went on a trip to Mt. Tiati in northern Kenya. I had expected to be starting work, but since my company had not secured the appropriate visa, I found myself with another week or so of time to do a multi-day trip. 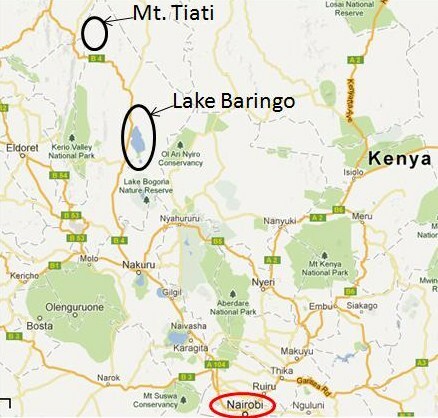 Luckily, the Mountain Club of Kenya was sponsoring a trip up to Mt Tiati. The posting on the website looked very enticing and I signed up. There was an organizing meeting beforehand and I met some of the people going. It was a good mix of some living in Kenya long term and others who were only here for a couple months. Seems the inspiration for the trip was an English fellow who had surveyed the area in the 1960's and was returning to Kenya in his retirement to see how the area had changed (or not). The trip was being led and organized by a German chap who also runs a tour company in Kenya and everything was wonderfully organized. 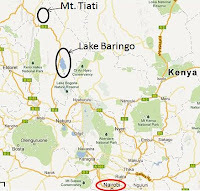 We left in a caravan of three Land Rovers/Cruisers on Thursday afternoon for the trip up to Lake Baringo where we would spend our first night. After a drive of four hours or so we arrived at Roberts Camp. It was nice to enjoy a cold beer on the front lawn. The surrounding area was an environmental disaster area, however. Seems a combination of very wet rainy seasons and silting in the lake has caused the water levels to rise so high that half the Camp was underwater. It was very hard to even see the lake since the water was into the trees and there was much debris floating around. Matter of fact, at least three or four buildings were underwater. Nevertheless, we camped there for the night and at about 4am a hippo had his dinner of grass right outside my tent. I didn't dare leave the tent for a bathroom break - hippos are actually the most lethal animals in Africa. The next morning we got an early start for the four hour drive to our next stop, Barpelo. Quickly we left the paved road and entered a long construction zone. Seems this road corridor is just starting to be developed as it leads eventually to South Sudan and there is oil up yonder. Here is a video of one of the climbs the 4X4s had to navigate. Once in Barpelo we hiked a small mountain called Skatkat. Oh my was it hot! Our guide told us it was a half hour climb - about four or five hours later we made it back down, all out of water! Also, since we were now in such a remote location, there were not even trails, we just followed the ridge of the mountain and animal tracks. Seems the last time our guide had been on the mountain was three years ago - when he was looking for his lost cattle! Next stop was the village of Kapunyany at the base of Mt. Tiati - our ultimate destination. To get there we left one bumpy, dirt road and turned onto another, even more bumpy dust road. For about 10 miles we traveled further and further into the bush, over and down dry river beds. It was fascinating to be so far off the grid and see a side of Kenya that is so far removed from the modern world. 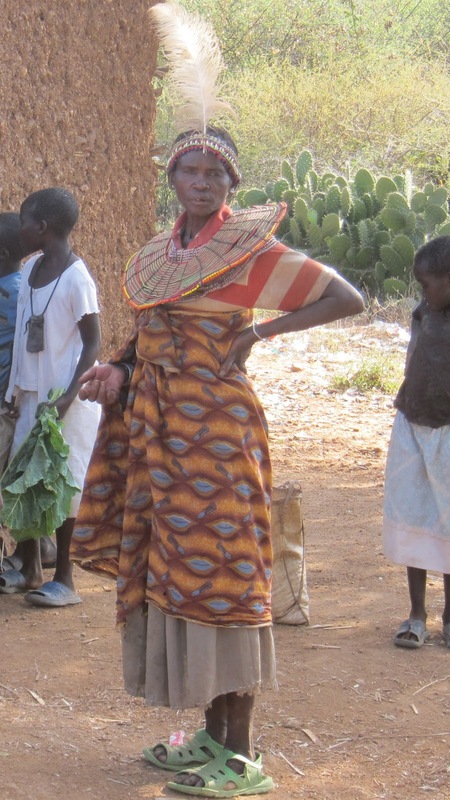 Some women still wore traditional dress and many people do not even speak Swahili. The Pokot tribe inhabits the area and life centers on goat herding. We stayed at a small clearing outside of the village, met some of the locals, and enjoyed a roaring camp fire. The next morning we were supposed to load donkeys to transport our gear and water to our camp high on the mountain where we were going to spend the next night. Unfortunately, the villager in charge of the donkeys reneged on his agreement and we were left high and dry. Many of us in the group began to doubt if the climb would happen. Seems it would be very difficult for us to hike up since there was very little water on the mountain itself and we would have to carry all of it up, plus since it was so hot and dry were going through copious quantities of it. Others in the village including the chief came to our aid and suggested we hire about seven local teenagers to act as porters. We jumped at the chance and began our trek. The hike began by walking through the village. It was eyeopening to see the traditional structures used as homes. After about six hours of tough climbing we arrived at camp just below the peak and enjoyed a beautiful sunset and a good meal over a campfire. In the morning we summited and enjoyed miles of unimpeded views in all directions. On the way down I shot a video of Pokot teenagers who acted as our porters. It was neat to see them joking around with each other. Truth be told we were all a bit worried how it would work with them as porters. We only had enough food, shelter, and water for ourselves, so they had to fend for themselves. In the end we did share a small amount but it was touch and go for awhile. But as they were in their home territory it all seemed to work out. By about 2pm we made it back to the village. There we rested and had a interesting chat with the chief about his domestic life. We then high-tailed it back to Lake Baringo - we were all keen to enjoy a cold beer after two days in the bush! Then next morning, after a final night of camping back at Robert's Camp, some of us went on a boat tour of Lake Baringo. This was a wonderful experience. We swam in the lake, bought fish from a local fisherman and used it as bait to see a fish eagle take a dive for it, wandered past crocs and hippos and basically enjoyed a relaxing morning on the water. Our boat guide also took us past another hotel on the lake which was flooded out. This trip will stay with me for a long time. The group I went with were all quite interesting and easygoing. We got to see wonderful things and experience a side of Kenya not easily seen. Click for here for some more pictures. I got an emailed copy of the MCK newsletter and was interested in the Tiati trip - one that I went on many years ago (in the 80s) when our family lived in Nairobi. I was a member of MCK from about 1986 to 1991 and enjoyed several trips with the club. Tiati was one of the best - and also the hottest climb I think I have ever done. We had to carry all our own water and the 5 litres I took was not nearly enought; very dehydrated by the time I returned. I also remember the vicious thorns that ripped skin and clothing. Nonetheless the views were superb and the company was great. Hope you managed to get your work permit. Yes, not much has changed! Yes, the heat was unreal and the thorns. But the whole experience was great. and yes I did get the work permit!